This article is the fourth in a series of white papers, Understanding Biochar. Biochar that is made from clean agricultural residues, such as woody material, leaves and grass stalks, it generally very safe for introduction into the soil if it does not have an odor, meaning it was heated to a high enough temperature to convert the biomass to stable carbon, and has relatively low ash, meaning all the stable carbon was not burned out of the char. Excess ash tends to appear as a gray dust – good biochar will show virtually none of that. Biochar should and will ultimately be an intentional material, not a byproduct of some random industrial process like a biomass gasifier or a fast-pyrolysis process. 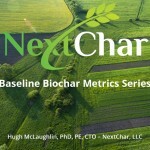 The desirable qualities allow the biochar to have maximum efficacy in benefiting the growing system and that benefit will last for a very long time in the soil. As such, doing it right the first time makes perfect sense to the party using and benefiting from biochar, which is the grower.